Our beach facing East. Gentle waves. No riptides to worry about. We're across from Great Island, Cape Cod National Seashore. Kitchen has ample room for cook help. 2nd floor rear bedroom. Queen bed. The 'Bunk Bed'' bedroom, 1st floor. A Twin/Twin and a Twin/Full. 1st floor front bedroom - small with Double bed, no closet. 1st floor front bedroom. King bed. Our sit-on-top Kayaks are great for beginners. Liv. area on 2nd fl. Water view. At night - moonlight over water. 2nd floor. Open floor plan. At night, listen to the gentle waves. This is the actual view from the Main House. 1st Floor large Family room with TV, a game table, and 3 sofas. Beach: 23 steps to private Sea Shells cottages beach. 23 steps walk to the beach. A south facing 2,000 square foot Cape Cod - colonial style 2 level home (1st and 2nd floors, no basement) with lots of windows, sliders, & decks. Full kitchen with full-sized appliances. This home comfortably accommodates extended families with privacy. Great place for kids. Explore the adjacent Cape Cod National Seashore, listen to the sea birds, walk to Great Island at low tide, collect shells, the swimming is excellent, relax. At night, listen to the sound of gentle waves. 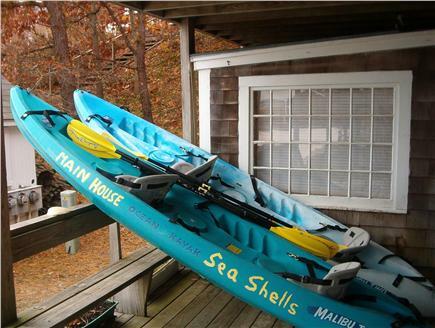 5 easy to use, sit-on-top Kayaks included for exploring the beautiful, protected Cape Cod National Seashore. Please note that occupancy in the prime rental season is strictly limited to 11 people. The Main House is part of an 'Olde Cape Cod' cottage colony known as the Sea Shells. Our beach is private, quiet, and beautiful. Gentle waves, no rip tides to worry about. GREAT for swimming, boating and young children. Wellfleet Harbor & Mayo Beach. 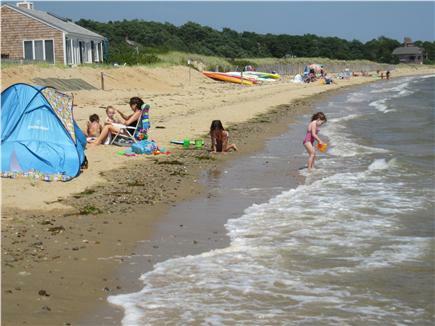 (TripAdvisor's Top 10 U.S. Family Beaches, the only 1 in New England.) Wellfleet Pier. Here you'll finds restaurants, a walk-up window for burgers, fried clams and ice cream with beach side picnic tables. Take a fishing excursion on the Naviator or rent a sailboat. There's an art gallery at the Pier too. Walk a little further to the historic village of Wellfleet for shops and Wellfeet's thriving art galleries. 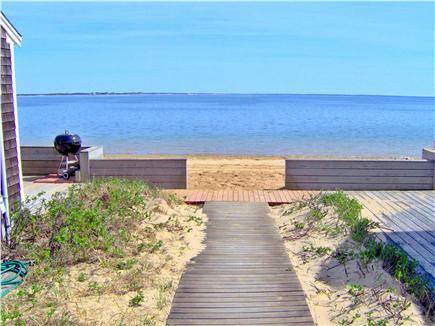 'The Gut,' a sand bar that connects Great Island with the rest of Wellfleet. Quiet, beautiful, secluded ..watch the sun set. Walk to the protected and secluded beaches of Great Island. This is part of the Cape Cod National Seashore. Explore! There is a inland trail to the site of a tavern from the 1700s. Try to make it to Jeremy Point, submerged except at low tide. Let your children roam the 'mud flats,' discover interesting sea life, collect shells! New for 2019: The 2nd floor bathroom has been remodeled and expanded. New sofas for the living room. 2 SUP boards! 5 Kayaks total. 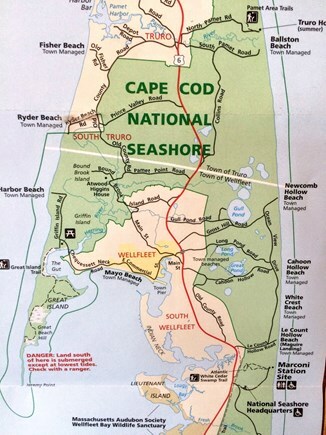 Explore the adjacent Cape Cod National Seashore. Expanded kids room. Mahogany front deck. 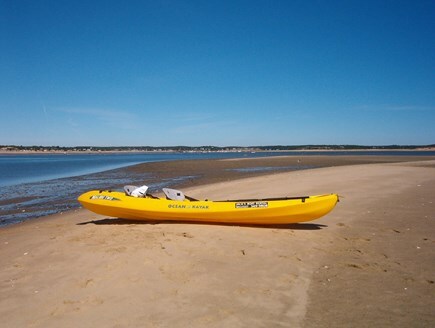 The Best kayaking on Cape Cod, swimming in Wellfleet's pristine kettle ponds, Wellfleet's magnificent ocean beaches & dunes, clamming, Wellfleet's world famous oysters, the village of Wellfleet - groceries, ice cream, Hatches fresh produce, fresh fish, blueberry pancakes for breakfast at the Lighthouse, art galleries, child-friendly restaurants, a farmer's market with local organic produce, deep water fishing in Wellfleet Harbor with the Naviator- they have the rods & reels & they'll clean the fish for you. Fish off the pier, there's a railroad bike trail in Wellfleet & many trails in nearby Provincetown, (bike rentals in Wellfleet). The Wellfleet drive-in, Wellfleet movie theatre, go to a show at Wellfleet Harbor Actors Theatre (W.H.A.T. Voted Best of Boston - Boston Magazine), see paintings of renowned artists in Wellfleet's varied art galleries, close to Chequessett Golf and Country Club - Wellfleet's seaside golf course. Visit Provincetown and go whale watching, grill on the Main House deck overlooking the water or dine at al fesco at Wellfleet pizza. Go out for lobster, the restaurants are child friendly. Call Mac's and order lobsters, they'll cook 'em for you, pick up at the Pier. There's the Wellfleet flea market, the Marconi site where Marconi invented wireless, visit the Highland Light Lighthouse in Truro. Audubon Society Wellfleet Bay Wildlife Sanctuary & nature center - what a great place! Whale watches, beautiful sunsets, scenic drives, learn to surf, sail, go birding, or don't go anywhere - just listen to the birds sing, the sound of the waves. From the Main House it's about 23 steps walk to the beach - kayak, swim, or collect sea shells, watch the oyster farmers tend to their oysters. Relax, let the kids have fun exploring, collecting, making happy memories. At night read a book, (we have a decent collection), we have Netflix, begin writing Your book, listen to the waves. The salty sea air is invigorating, sleep will be restful. A very large family room with TV, DVD, a game table, board games, toddler toys, toddler table and chairs, children's books, 2 futon sofas convertible to 2 Full beds, a love seat Twin convertible, an extra refrigerator, and extra coffee maker. This room has a door so it can be used as a sleeping room. Front Bedroom with a King bed. Small front bedroom with Full bed, no closet. The back of Main is sand. It has a small deck, rocking chairs, a Ping Pong table, some outdoor games and toddler beach toys. Open layout with cherry hardwood floors. Full sized, fully equipped kitchen with sink island that seats 4 on counter chairs, stainless steel oven, refrigerator, dishwasher, 2 sliders to our 40 foot mahogany deck, a gas grill. Outdoor dining with views of water. Dining area seats 8 to 12 at a hardwood table. (The adjacent island seats 4). Bay window. Great water view. At night, watch the moonlight reflect off the water. Hear the water lapping on the beach. Open layout - kitchen, dining, living room. The living room has a love seat, chair, sofa, HDTV, DVD, wireless high speed internet access, Netflix and Amazon. Walk-thru bedroom with a Full bed. Rear bedroom with a Queen bed & it's own full bathroom. Nearest beach: 23 steps to private Sea Shells cottages beach. Additional availability info: Spring & Fall weekends are available. Inquire. Additional pricing info: Discount for small families or groups. Discount for returning guests. $240 cleaning charge. State and local taxes of 12.45% will apply. 4 steps up to the front door or 1 step up to the rear door. Sand in front and back. 1st floor bath with bathtub. 2nd floor bath has a shower, no tub. Kitchen/dining is on the 2nd floor. Our best Cape Cod vacation! I came here with my family - 8 adults and 5 kids (all under the age of 8) and had such a wonderful time. This house is right on the water, which makes it super convenient for the little ones. We didn't need to worry about packing up all our gear and food since we were able to just walk back to house if we forgot anything or got hungry. This saved us time and allowed us to spend the entire day on the beach. Looking forward to having you back in 2017! Our family loved our stay at the Main house. We loved the convenience of the beach right outside our door and enjoyed the views from the deck and house. We took advantage of all the activities Wellfleet has to offer. We went swimming in the ponds and ocean and went hiking on Great Island, The kayaks and the ping pong table are a real plus. The house is roomy and well-stocked. We're looking forward to going back! I loved going to sleep and waking up each day so close to the bay. The house is tucked into such a perfect spot. There was a lot of space for a good number of guests, and the house had everything we needed for an amazing week in Wellfleet. Very comfortable! It's a great location for quick walks to the pier, and it was also not far from a number of hikes, ponds, the ocean side, and the town center. I'd go back any summer! 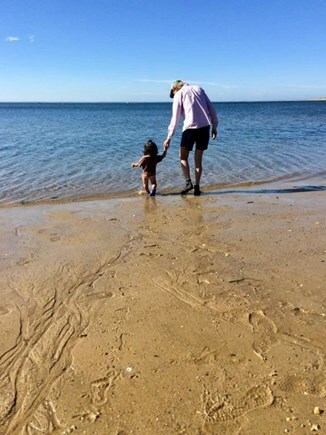 My wife and I has been going to Wellfleet for many years, first with our children and now alone or with friends.. We enjoy this beautiful house because of two main reasons: 1)near the beach and 2) walking distance to the center of town and shops. The house is well equipped with everything that you might need while on vacation. My two favorites pieces of equipment are the kayaks and the ping pong tables. I have gone kayaking with my friend to Great Island. The porch overlooking the bay is amazing. We have spent a lot of hours on this porch reading, talking or having dinner at night. The location of this house allows us to go bike riding on the bike trails, swimming in Long Pond, and hiking on Great Island. Looking forward to having you back this Spring. My family of 6 thoroughly enjoyed ourselves last August. The location is hard to beat, with a lovely, sandy beach steps away with a killer view. The house was very homey/comfortable in the best sense. One of the owners, Howard, was a joy to work with. The Main House is a beautiful place in a quiet cluster of beach-front cottages. My family and always some assorted friends have been staying here for 10 or so years now for a week each summer, and I don't think we could ask for more. So I really owe a review. From the second floor and its long, spacious wooden balcony, where there's a view of the sea, and from the first floor, you can simply walk a couple hundred feet to the beach itself. The house is very tastefully arranged and has all sorts of amenities, from kayaks to a ping-pong table, a wide screen TV to a second-story porch grille, and a backyard. This is the kind of place that can really hold a sizable group of people. The first floor is a nearly complete living space on its own, with several bedrooms and a full-sized fridge, a spacious living room and sliding glass doors leading to a backyard area with ping-pong table. The second floor has a master bedroom, a kitchen with a giant island, and a long table for sit-down meals. Plus comfy couches and giant chairs for group hang-outs or movies. 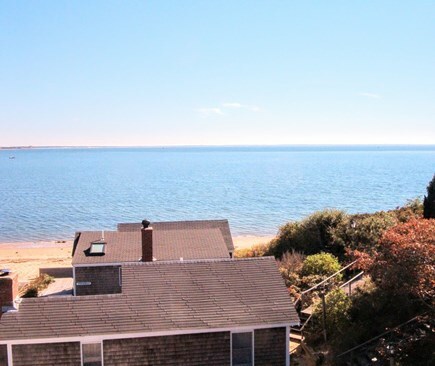 The house is really well-located, just a few minutes' drive from the Wellfleet pier and the downtown area and 15-20 minutes to ocean beaches and ponds.